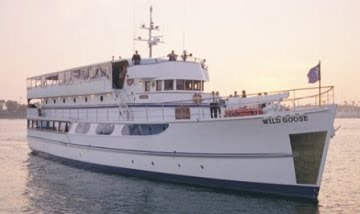 WILD GOOSE - John Wayne's yacht is on display at the Lido Yacht Expo in Newport Beach this weekend, so it's only fitting that we chose "Wild Goose" as the boat name of the day for Friday. We pick our daily names from customers of our two boat name stores, BoatNameGear and CustomBoatNames, as well as from boats of interest that we see on the water or in the news. We announce The Boat Name of the Day on Twitter every weekday. Suggestions are welcome via email, but you must share the story behind your boat name. If your creative juices are flowing and you're full of boat name ideas, please help another boater name their boat at the Boat Name Blog. Was it Marion Mitchell or Marion Michael Morrison?